1. Sixty-three percent of unmet requests were for housing; including emergency shelter, transitional housing and long-term housing. More than 5,000 requests for emergency shelter went unmet due to lack of resources. Leaving is the most dangerous time for a victim of domestic violence; safe shelter is crucial for survivors who are facing life-threatening violence. 2. Many victims escaping abuse do not have the transportation needed to get to shelter. This is especially difficult for survivors living in rural, isolated, or geographically-scattered communities. Local domestic violence programs may only have a limited number of bus passes for their clients, or they may not be able to provide transportation services at all. 3. Financial abuse can be devastating, and poses both short- and long-term consequences. One Florida advocate shared that a survivor was harassed by her abuser so much that she had to change jobs three times. This particular survivor, with the help of her advocate, was able to secure a new job and transitional housing for her and her children. 4. Eighty-three programs were forced to reduce or eliminate their legal advocacy program in the past year, leaving only 51 percent of programs nationwide with legal advocates. Legal cases involving domestic violence are often difficult and complex. Survivors who don’t have legal representation are frequently further victimized. 5. An increased need for domestic violence services means an increased need in funding programs to meet the needs of survivors. 1. Give back. Volunteer with your local program. 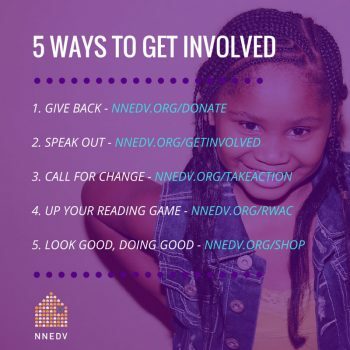 Donate to NNEDV or give to your state domestic violence coalition. We can make change, but we need your help. 2. Speak out. Know the facts and join the conversation on Facebook, Google+, Instagram, Pinterest, Twitter, Snapchat, and Goodreads. Share stories and news about this issue and why it’s important to you. Raise your voice to make a difference in your community. 3. Call for change. 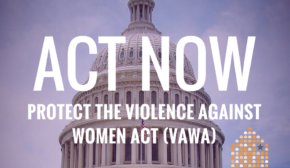 Find your Senator and/or state Representative and tell them about the importance of funding domestic violence services through the Violence Against Women Act (VAWA), Family Violence Prevention and Services Act (FVPSA), and the Victims of Crime Act (VOCA). 4. Up your reading game. Many of today’s popular books address issues that are connected to domestic and dating violence, sexual assault and stalking. Reader With a Cause is a community that discuss issues like equality, empowerment and violence against women as they appear in contemporary books. 5. Look good, doing good. Use your fashion choices to raise awareness. 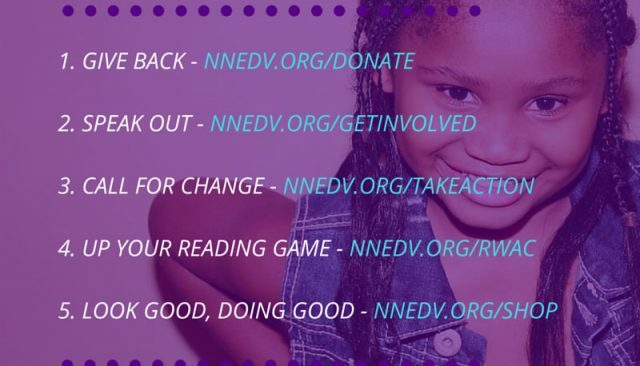 All proceeds from NNEDV’s online store go to helping end domestic violence.